Candy Bomber: The Story of the Berlin Airlift's "Chocolate Pilot" by Michael O. Tunnell. (Grades 3-7.) Charlesbridge, July 2010. 110 pages. Review copy provided by publisher. In accessible text and with many photos and other visual aids, Candy Bomber tells the story of Lt. Gail Halvorsen, an American Air Force pilot who delivered candy to hungry children in West Berlin after World War II. At that time, Berlin was divided, with the Allied Forces controlling West Berlin and the Soviets controlling East Berlin. Because Berlin was located within the Soviet territory of East Germany, the Soviets tried to force the Allies out of Berlin by blocking ground and water transportation. The only way to get food and supplies into West Berlin was by air, so the Allies manned hundreds of flights to bring in the necessary staples. One day when Lt. Halvorsen was touring the city, he came across a group of kids watching the planes, hungry for any information about the outside world. Halvorsen gave them two sticks of gum he had in his pocket and he had an idea - he would start dropping sweets for the children of Berlin. Many pilots were willing to give up their candy rations for the kids and the project snowballed into "Operation Little Vittles", with candy companies and people all over the United States donating candy and homemade parachutes. To me, this is a great example of the best kind of children's nonfiction - an interesting story, possibly unknown by many kids today, brought to life with readable text and archival photos and other visuals. 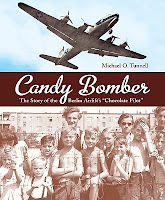 Author Michael Tunnell includes a great many photos, along with scanned-in letters and drawings from the kids who received the candy (and some who didn't!). This is a story with great kid appeal. Not only is it about candy (who doesn't love candy? ), but the fact that the story is about children will allow today's kids to put themselves in that place. The book's short enough that it's not overwhelming and the narrative moves along at a clip. It'll appeal to kids interested in World War II, but I think it'll have great general appeal, too. Read more reviews at Everyday Reading, The Fourth Musketeer, and Wrapped in Foil. Candy Bomber is on shelves now! And Happy Nonfiction Monday! Head on over to Playing By the Book for this week's roundup!